In yesterday's WWDC keynote, Apple demoed a host of new features planned for iOS 8. While some of these announcements were clear ecosystem plays aimed at their best customers (HealthKit, Family Sharing, Continuity), others were features assimilated from third-party standalone apps (iCloud Drive, Messages). There seems to be a view in the industry that valuable services eventually end up as "features" integrated into the OS layer. While there is some truth to this statement, it isn't remotely universal. Rather, it depends on the nature of the service. 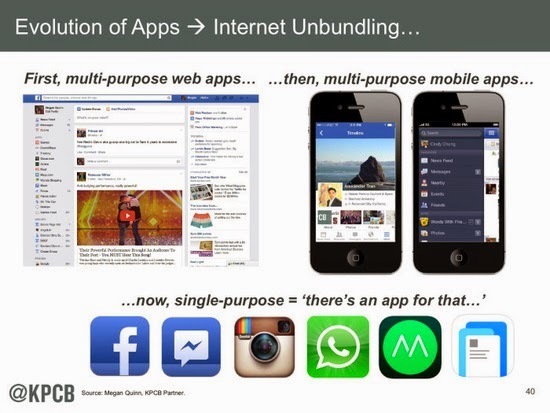 Before we begin, I think it's important to highlight a trend that Mary Meeker mentioned in her 2014 Internet Trends report -- We are currently witnessing a shift from the integrated service delivery paradigm to one where we access multiple single use apps integrated by the smartphone interface. Because of the centralized and streamlined software distribution mechanism on mobile platforms (app stores), it has become far easier to locate and install specific apps as compared to the PC era. Therefore, it is just as easy to use multiple apps for multiple jobs as it is to use a single app for the same jobs. The only challenge here is app discovery and not fragmentation at the service layer. Now, there are two primary categories of services that Apple has integrated into their OS -- background processes (syncing) or utilitarian services (iCloud Drive) and social services (iMessage). But only some of these are likely to have a meaningful impact on third party offerings. Background processes and most utilitarian services (photo syncing, for example) are fairly easy to integrate into the OS layer. This is because it is assumed that most users are "lazy" and don't want to put any effort into making their devices work right. From their perspective, they should work right from the word go. For more involved utilitarian services like cloud storage, some users prefer to have them built in but with certain caveats. If customers already use a third-party cloud storage app like Dropbox or Google Drive, it could take some effort to transfer their files to iCloud Drive. If we assume that users are "lazy", they may not make the effort to transfer data (except for the minority that actually pay for more cloud storage). However, this service could be considerably attractive to iOS users that are new to cloud storage. On the other hand, the discovery and usage of social services is primarily driven by network effects. After the initial wave of early adopters, here's how social services are normally discovered -- User A tells user B about a cool new messaging app he's been using with his social circle. User B installs app to communicate with user A and so on. This makes it even more important for social services to be cross-platform. It doesn't really matter if user B uses another app as well because apps are integrated by the smartphone interface. There is already evidence of this as a majority of smartphone owners use multiple messaging apps -- the biggest reason for this is that different friends use different apps. Therefore, users could certainly use iMessage to communicate, but that is unlikely to be at the expense of a Snapchat or a Whatsapp. While platform owners may continue to add features and strengthen their respective ecosystems, I believe they have reached a state where innovation is mostly incremental. Going forward, the focus of industry innovation is likely to shift to the services layer on top of existing platforms.